"Foundations" is only $10.00CAN plus shipping and taxes where applicable! 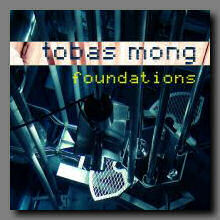 "Foundations" by Tobas Mong is a brilliant collection of angular tracks, melodic and atmospheric, altogether wonderful. Minimal melodies and arpegios are paired with more complicated structures and rhythms in a tasteful and clever manner resulting in a particularly appealing blend of styles. Percusive tones vary in complexity but maintain a level of sophistication throughout. Surely this is IDM at it's finest.